Like all organisms, plants are associated with bacterial communities in which helpful and harmful bacteria compete for dominance. Among the weaponry of these warring bacteria are molecular syringes that some bacteria can use to inject toxins into others. In a study published in the February 2 issue of the Journal of Biological Chemistry, researchers at McMaster University in Canada pinpointed the identity of one such toxin used by a soil-dwelling bacterium that protects plants from disease. The bacterium Pseudomonas protegens can kill soil-dwelling plant pathogens, including fungi and bacteria that attack the roots of important crops such as cotton. 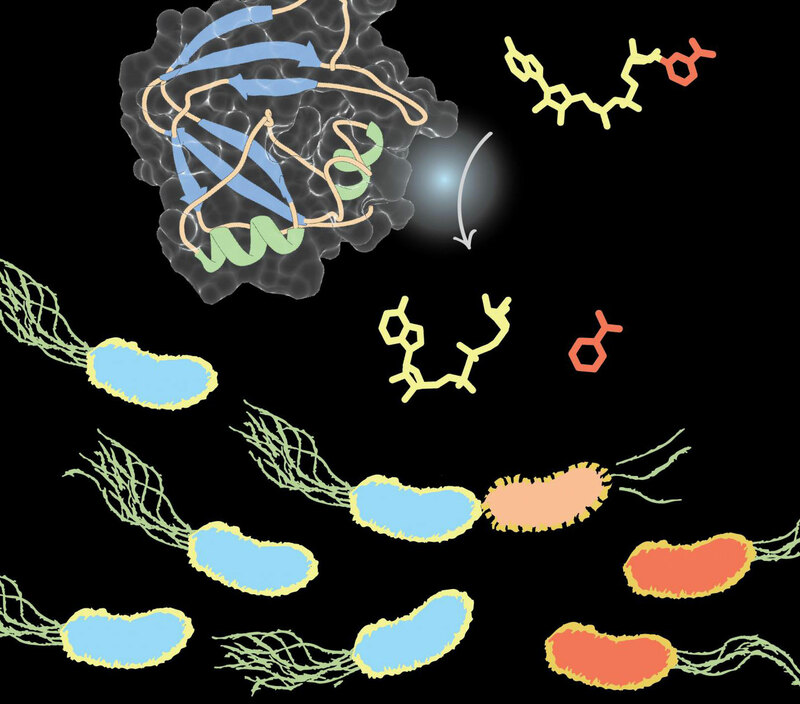 Pseudomonas protegens releases diverse antimicrobial compounds into the soil, but John Whitney was curious specifically about the compounds that it was injecting directly into other bacteria through the type VI secretion system, or T6SS. Jenny Tang and Nathan Bullen, undergraduate students from the University of Waterloo working with Whitney on a co-op work-study assignment, spearheaded the discovery that the toxic protein used by P. protegens against other bacteria acts on a molecule found in nearly all living cells: nicotinamide adenine dinucleotide, or NAD+. NAD+ is a cofactor, or “helper” molecule, in many biochemical reactions. By injecting a protein that destroys NAD+, P. protegens is able to kill other bacteria. The team then investigated the genome sequences of many other bacteria to see how widespread the strategy of targeting NAD+ is in microbial warfare. They found that many bacteria with secretion systems carry genes similar to the one encoding the NAD-targeting toxin. The abundance of these toxins in nature raises many questions: How do different bacteria in different environments evolve to resist this toxin? Are NAD-targeting toxins more effective against some bacterial species than others? Understanding the diversity of bacterial weapons is an active area of study among agricultural researchers who would like to develop better ways to fight plant diseases. “The identification and characterization of antibacterial toxins produced by plant-protective bacteria may one day allow us to engineer these bacteria to have enhanced ability to suppress pathogens,” Whitney said. Be the first to comment on "Biochemists Reveal New Insight on Bacterium That Protects Plants From Disease"